Learn about Marine Life, Shells, and Fossils at Ocean Lakes Nature Center. Take Magnolia Lake Circle, turn left at Site Z-67. Our new location is behind Sandy Mart. Read more about it on our Blog. A one of a kind facility in this area, the Ocean Lakes Leonard Raker Nature Center Discovery Lab focuses on marine life. It all began with Leonard Raker, Founder and Curator (now retired), he traveled extensively during our off-season gathering items for exhibit. Our Certified SC Master Naturalist, Brandy, has a degree in Marine Biology and loves to help guests learn about the ocean. The Nature Center offers exhibits and information on shells, fossils, sea life, Ocean Lakes history, area wildlife and ecology of coastal South Carolina. Our knowledgeable team is on hand to identify items discovered on our nearly one mile of the Atlantic Ocean beach and answer any questions you may have. They also know where all the good “shell” spots are located along the Grand Strand. Join them on a beach walk or for an educational program. It will be enjoyed by the entire family! Stop in to meet Spot, a Leopard Gecko, and see our live baby alligator. For our younger guests with upcoming science projects the Ocean Lakes Nature Center is a great place to gather information and get a head start. Brandy would love to assist you on ideas and marine life info. Make sure to follow up with them next summer and let them know how your project turned out! If you are at Ocean Lakes this summer please check out our hands on, educational nature based activities in the Summer Activities calendar. Family’s have enjoyed the interactive “Dig and Discover” located outside adjacent to the building. Enjoy the outdoors near Magnolia Lake while your little ones dig in! Off Season: Monday-Friday, 11 AM – 3 PM. Phone: (843) 828-4837. Learn | Participate in Activities | Become a Jr. Naturalist! Check our monthly Activities Calendar for details. New! Sr. Naturalist for age 9-12 this summer. 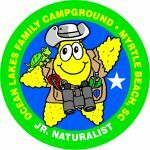 The Ocean Lakes Family Campground Jr. Naturalist Program (5-8 years old) is a nature-based badge program hosted by The Leonard Raker Nature Center Discovery Lab. Participants must complete specific activities from the Nature Activities calendar to earn a badge and become a Jr. Naturalist. Jr. Naturalists can complete the program annually and will earn an additional badge each year they complete the requirements. Jr. Naturalists must be ages 5-8. Sign up at the Nature Center, $3 per child, cash only.